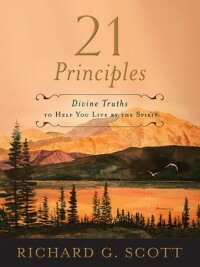 Richard G. Scott shares the most important truths he was learned in life in his newest title 21 Truths. each chapter outlines a principle to ponder and adopt. As an artist who often feels the pull of being creative juxtaposed with trying the same things over and over again, I truly appreciated Principle 3 "Repeatedly I have been impressed to learn that to reach a goal never before attained, one must do things never before done." Elder Scott talks about how on a visit to a close friend he was fascinated with his ability to create beauty using brushes, watercolor and paint, and had the impression "Try it." He did just that, and the cover of his book is a print of one of his watercolor paintings. When I noticed the signature on the dust jacket I felt uplifted and encouraged to go out on a limb. This book is power packed with sound advice and the way to apply it in our lives. If applies with prayer and perseverance these principles will set your life on the right course. I would recommend it for a Father's Day gift!